Coffee Pot Stamping Cafe: Going! Going! Soon To Be Gone! Going! Going! Soon To Be Gone! Yes, it's that time of year again. 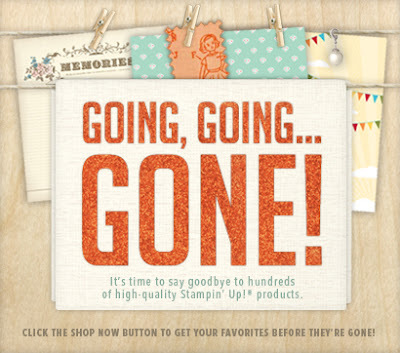 Time to say good-bye to those stamp sets that are retiring from the 2011-2012 catalogs. The list is longer this year due to the transition to a new Annual Catalog and there are a higher number of stamps being replaced and refreshed but our stamp lines will still be plentiful. Here is a link to the list so you can see what's retiring at the end of May... Retired Stamps. Now is your chance to get those stamp sets you've had your eye on before they are gone. Many products are only available while supplies last, so order early. One Week Left Of Summer Smooches! He Died For You. What Have You Done For Him? What Do You Do On Your Coffee Breaks?